Federal and provincial officials attended a commissioning ceremony earlier this month to celebrate the completion of the $71-million North Red Deer Regional Wastewater Transmission System, which connects the mid-size Alberta city’s wastewater facility to Lacombe, Blackfalds and Lacombe County through a 28-kilometre pipeline. After one year of design and geotechnical services that began in 2015, followed by one year of construction, the new system now boasts two major lift stations, emergency storage reservoirs and odour management measures, according to a project outline. “This new service also eliminates a significant barrier to development, and allows our community to grow and prosper,” Lacombe Mayor Grant Creasy stated at the May 4 ceremony. Lacombe will provide management services for the North Red Deer Regional Wastewater Services Commission for a rate of approximately $30,000 per month. The wastewater forcemain pipeline uses a fused jointless pipe and is a closed system to the atmosphere. It uses pipe sizes ranging from 700 mm to 900 mm in diameter. Preliminary Treatment: Removes the larger solids from the wastewater stream through a screening process. Primary Treatment: Once the larger solids are removed, the wastewater is allowed to settle. The settled sludge and risen scum are pumped to other areas of the plant for further treatment. Secondary Treatment: Wastewater is pumped into tanks containing bacteria that break down waste products into less harmful substances. Once this process is complete, remaining solids are removed. Tertiary Treatment: Red Deer is installing an ultraviolet disinfection process at the wastewater treatment plant to deactivate microorganisms that remain after secondary treatment. Equalization Lagoons: Red Deer’s equalization lagoons provide a holding place for wastewater during high flows and power outages. From 2016 to 2017, Lacombe’s per cubic metre wastewater consumption rate for taxpayers jumped by more than 50 cents to $1.47. A similar increase is expected for 2018, according to the North Red Deer Regional Wastewater Services Commission. The Government of Canada contributed $29.8 million to the project under the Clean Water and Wastewater Fund. 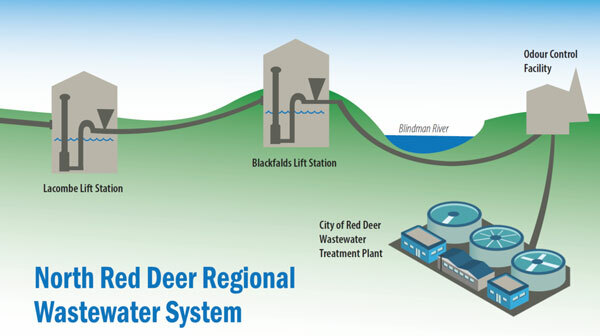 The Government of Alberta provided approximately $33.2 million, and the North Red Deer Regional Wastewater Services Commission covered the remaining costs, including a small contribution from the City of Red Deer for future wastewater flows.